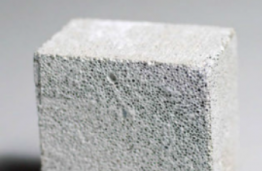 The new aerated concrete composition allows to achieve highly stable properties of the concrete. The proposed composition reduces the cost of the concrete thanks to using secondary raw materials. The non-autoclaved aerated concrete based on the modified binding composition containing a supplementary cementitious material, reinforced with polypropylene fibers is characterized by the compressive strength of 2.0…3.0 MPa, with the density of 600…650 kg / m3. Pore size – 0.2-1.0 mm.